This is the fourth book in the DI Stephens and Max Mephisto series. Known as the ‘Magic Men’ they had been part of a top-secret espionage unit during the War. It is set in 1953 at Christmas just a few months after the previous book in the series, The Blood Card and magician Max Mephisto is still sceptical about performing magic on TV with his daughter Ruby in a show called Magician and Daughter. 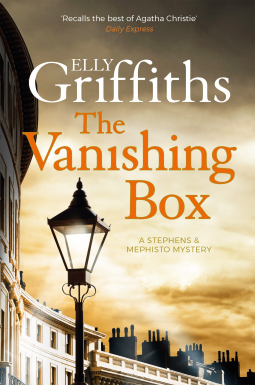 Meanwhile his old friend, DI Edgar Stephens and his team are faced with solving the murder of Lily Burtenshaw, who had been strangled and found in her room tied to a chair, leaning forward and pointing to an empty crate with ‘King Edward Potatoes’ written on the side. Max and Ruby are performing at the Brighton Hippodrome using a human sized version of the Vanishing Box in their act. The variety show also includes an act called the Living Tableaux, showing scenes from famous paintings or classical statutory, posed by a troupe of showgirls, naked apart from skimpy flesh coloured pants. Two of the showgirls, Betty and Janette, have become friends with Lily and are lodging at the same boarding house, but Edgar wonders if there is another connection between Lily and the Living Tableau? There is something so theatrical about the way the body was posed. Edgar and his two sergeants, Emma Homes and Bob Willis, begin their search for the killer, looking for motives and suspects. Then more murders are discovered and it becomes a desperate hunt to find the killer before he/she strikes again. I enjoyed this book but for me there is too much focus on the main characters and their relationships. Edgar is engaged to Ruby, although Max is still not too happy about it. However, his work means he isn’t able to spend much time with her. Meanwhile Emma’s feelings for him are getting stronger and their relationship deepens as she is drawn into deadly danger. Max’s relationship with Mrs M, his landlady in Brighton, is winding down and he is attracted to Florence, another one of the showgirls. I liked the insight into the 1950s, particularly the theatre life. Illusion and misdirection play a large part – from the acts in the variety show to the murders, and all is not what it seems. The misdirection in the form of several twists and turns threw me off course.The clues are there, if you can but see them, yet I still had little idea who the killer could be until very near the end. My thanks to Quercus Books and Netgalley for an advance review copy of this book ahead of publication on 2nd November. I agree, Margaret, that Griffiths does a fine job of placing the reader in terms of time and location. This is an interesting series, too, and I like the Max Mephisto character. You’ve got a point about how much emphasis there is on the interactions among the characters; we’ll see where she goes with the next in the series! I think that the way it ends seems to indicate a complete change of direction! I agree – and you’ll be pleased, I think, that things do move on – can’t really say any more. I haven’t even started on this series although I’ve been reading her Ruth Galloway books. I have some catching up to do. Thanks. I really like the theatrical setting in these books – looking behind the scenes.